"I use to beg my mom to make these for me when I was growing up. Now I make them for my 2 daughters and they absolutely love them!" Preheat waffle iron. In a large mixing bowl, stir together flour, baking powder, salt, sugar and cocoa. Stir in milk, eggs and butter until mixture is smooth. To make hard sauce: stir together softened butter, confectioners' sugar, vanilla extract and milk. Sauce should be fairly stiff. Spray preheated waffle iron with non-stick cooking spray. Pour mix onto hot waffle iron. Cook until golden brown. Serve hot with hard sauce. 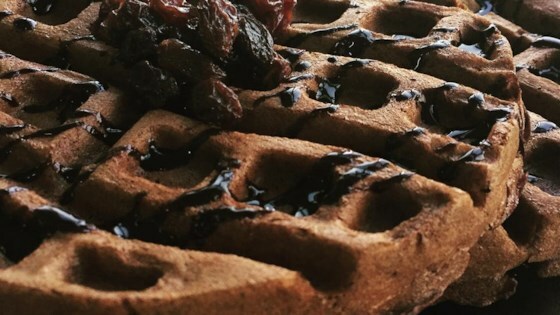 Make a sweet treat for breakfast with this recipe for chocolate chip waffles. These were ok. I didn't think the chocolate flavor was strong enough and I agree with other reviewers that they had a very pancake like texture. i mixed the dry ingredients and used as a present with a waffle iron for my mom. she asked for 3lbs of the mix. said it was absolutely wonderful! Very good recipe! Simple and tasty, my little brother loved these waffles, as well as my mom. Way to go Jenny! This recipe is a winner.